CALGARY, Alberta – Not long after Dalton Harding started his own painting company, he was already figuring out how to step away from it. Developing a pre-planned exit strategy, he says, will enable him to ensure a smooth transition as he passes on his business to a trusted core of partners. Growing up on a farm in southern Alberta, Harding says, taught him that you "get out of life what you put into it." That attitude served him well as he first entered the painting trade in 1980, and 17 years later when he started his own company in Calgary, which with a population of just under a million is the western Canadian province's largest city. Within a few years of establishing Harding's Painting, Dalton decided to pursue a master's degree in business administration. "It opened my horizons to new things," he says. "I was looking for more knowledge in the accounting and marketing areas, and it helped me find out what I didn't know." Though generally geared toward corporate positions, studying for his MBA convinced Harding more than ever that he wanted to be in a small business – and that the best model was an employee-owned business. He began to delegate more responsibilities and offer ownership opportunities to the most promising workers. Now the company has nine licensees, each developing their own geographic area of the sprawling Canadian city. Though each runs their own territory, all share a common headquarters, meet monthly as a group to plan company strategy, and communicate with each other on a daily basis about jobs and training and developing painters. With this strategy, Harding's Painting has become one of the largest residential repaint companies in Calgary, bringing in annual sales of $4 million and winning the local Consumers Choice Award for four consecutive years. "I'm absolutely convinced we can service our customers better as a group than individually," Harding says. "The whole idea is synergy. We operate in a very entrepreneurial style rather than a top-down, dictatorial system. People have a stake here, and as a group we have cost efficiencies and benefit from sharing a common brand." What's next on the horizon for Harding? He turns 52 this year, and it will be a transition year for him. He plans to exercise his option to sell a major portion of his division of the company, but will continue on as chairman for at least another year to ensure a seamless transition. He'll be able to spend more time with his family and devote more hours to his favorite volunteer community projects, with the knowledge that his paint legacy will live on and the equity he's built will ensure a comfortable retirement. "The painting business has been extremely rewarding," Harding says. "There are no barriers to entry, and if you are ambitious and willing to learn the business and work hard, there are no limits to what you can accomplish. I will be pursuing my dream of working in a humanitarian field of work, which would not have been possible without the success of this business." BOCA CHICA, Dominican Republic – From the start, Michael Serafini has always thought big. At age 21, after serving in the Navy, he returned to his home in Port St. Lucie, Fla. and carefully considered his future. Should he re-enlist? Look for a job? Enroll in college? No, he decided. He wanted to own his own business. After studying all his options, he concluded his future was in paint. In 1986, he founded Michael Serafini Painting Contractor, Inc. Within a decade, the company was grossing more than $2 million a year in commercial and residential work. To take it to the next level, Serafini targeted industrial work. A Cincinnati-based firm called Enerfab gave him his first shot coating floors and tanks at a Florida citrus plant, and he never looked back. Since then, he’s tackled everything from tanks and floors to power plant structural steel and a shuttle pad at the NASA Space Center. Now, at age 40, Serafini has taken on his most ambitious project yet: Opening an industrial painting firm in the Dominican Republic. in Boca Chica, a small beach town on the southern coast of the Dominican Republic. A few miles away lies one of the island’s largest landmarks: a 107,000-square-foot boiler that is the heart of a power production facility owned by the global AES Corporation. Along with a second AES plant, the complex provides the Dominican with a third of its daily power needs, and houses a 42 million gallon natural gas tank – second largest in the world. 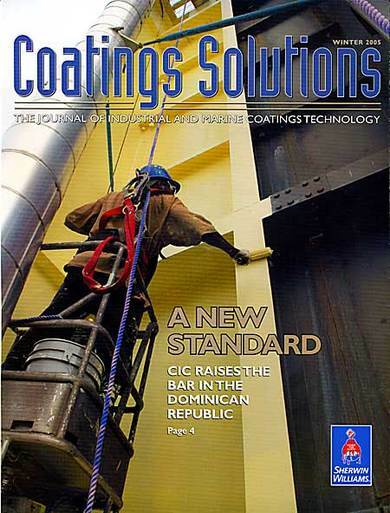 A crew of 10 painters from Serafini’s company, Caribbean Industrial Coatings (CIC), is busy applying a new beige topcoat to the walls of the gray boiler. The work is hot and tricky, especially on the east-facing side, where access through a thick network of pipes and beams requires a one-man Spyder lift, along with strict adherence to CIC’s rigorous safety standards. Safety, access and weather aren’t the only challenges, though. There were several discolored sections on the boiler from the prior paint job, so Serafini brought in a thermal photography specialist and technical experts from Sherwin-Williams to test every square inch of the boiler. They found “hot spots” on about 20 percent of the surface, with spikes exceeding 500 degrees F. Working closely with his Santo Domingo Sherwin-Williams rep, Serafini devised a coatings system plan that would provide maximum protection at the most efficient price point. CIC crews coated 80 percent of the exterior with a system of Macropoxy 646 Fast Cure Epoxy as a primer, followed by DTM Acrylic Coating, a topcoat that performs well at temperatures up to 110 degrees F. For the hot spots, they used a system of Hi-Temp 1027 Primer and Hi-Temp 500V HA, a silicone acrylic coating able to withstand severe thermal cycling up to 600 degrees F. By carefully identifying the hot spots and using the higher-cost Hi-Temp coatings only in those areas, CIC saved AES almost US$260,000. The next decade, he says, promises exponential growth in the Caribbean country, and CIC is preparing for sales increases of up to 100 percent a year for the next five years. Serafini has installed one of his most experienced and trusted project managers, Texas-born Alfonso Gamboa, at the helm of his Dominican operations, and hired Laura Breton Despradel, a Dominican attorney, as his financial officer. Besides power generation, CIC is targeting the pharmaceutical, food and beverage, water and wastewater, industrial flooring and general industrial markets. After the Colorado Floods, Painters to the Rescue! BOULDER, Colorado – A year ago this September, Colorado was hit by one of the most devastating floods in state history. Heavy rains created record high water that spread almost 200 miles along the Front Range of the Colorado Rockies. When it was over, eight people were dead, and over 12,000 more had been evacuated from their homes. Nearly 18,000 buildings were damaged, and over 1,500 were destroyed. The total property damage was more than $2 billion across 17 counties. Boulder County was among the worst hit. Dave Barry is one of the many local painting contractors who answered the call to assist neighbors and help rebuild their customers’ lives. Originally from Boston, Barry had moved to Colorado in 1996. He eventually settled with his family near Jamestown, a mountain town of 240 people located along one of the picturesque canyons northwest of Boulder. The town became completely isolated due to road damage from the 2013 rains and the flooding of James Creek. According to the town website, 20 percent of Jamestown’s homes were lost and 90 percent of its population has been forced to relocate. “I was one of the lucky ones,” Barry says. His home is just off the Peak to Peak Highway at the top of the canyon, so was untouched by the rising waters. But phone service was down and all roads leading to Boulder, Denver, Lyons and Estes Park were closed. “The Peak to Peak was open, but we couldn’t go down the canyons and get anywhere,” Barry says. He was able to find a few spots along the highway with cell phone service so he could contact customers and employees. Stranded in the area for two weeks, he spent much of his time helping less fortunate neighbors and relied on his three project supervisors to handle the rapidly growing number of paint projects in the city of Boulder, where most of his customers live. One of Barry’s customers lives near Eldorado Canyon State Park just south of Boulder. Just two months earlier, Barry and his crew had finished a total repaint of her home. Then the floodwaters rushed in and ruined everything. The workload has eased now but Barry and his painters are still working on projects brought on by the flooding. Several customers’ homes in the foothills of Boulder were severely damaged by massive mudslides, and repainting had to wait until after the cleanup and structural damage was repaired. In the town of Berthoud, seemingly far away from the flood danger zone, one farmhouse was inundated when a dam broke and the channels built to handle normal spring runoff couldn’t contain the overflow. After the waters rushed through, mud had completely filled the first floor and was several feet deep on the second story. Once the debris was cleared, Barry and his crew came in to put the finishing touches on the interior. ProMar 200 Zero VOC Interior Latex was used on textured walls. For smooth drywall, the choice was Cashmere Interior Acrylic Latex. Woodwork was finished with a system of Sher-Wood Fast Dry Vinyl Sealer followed by Sher-Wood Hi-Bild PreCat Lacquer. Bottom line: In good times or bad, it all comes down to a matter of trust. Likewise, Barry had built his reputation with responsive customer service, the highest quality workmanship and, perhaps just as important, a positive attitude. All were attributes that served him and his customers well during the trying circumstances brought on by Mother Nature. FRANKLIN GROVE, Illinois – Running from New York’s Times Square to Lincoln Park in San Francisco, the Lincoln Highway is the nation’s first trans-continental highway. Near the middle of its 3,000-plus miles is the National Headquarters of the Lincoln Highway Association in Franklin Grove, Illinois. The village of 1,000 people is also home to one of the highway’s oldest – and newest – attractions: The Lincoln Way Inn. Built by lumberman C.D. Hussey in 1912 – one year before the Lincoln Highway was completed – the inn found new life last summer when it was reopened as a boutique bed and breakfast. Turning the 104-year-old property into a premium tourist destination was a year-long labor of love for owners Lisa and John Ayres and Brumbly Brothers Construction. The building exterior was stripped down to bare walls, and new additions expanded its footprint from 4,000 to almost 7,500 square feet. Extensive interior renovations were made as well, and Emerald Paint was used throughout the project on both exteriors and interiors. Even the owner has noticed, he says, remarking on the ease of cleaning walls painted with Emerald Interior Paint. The project also called for a lot of Minwax and Sher-Wood wood finishes on both horizontal and vertical surfaces. In addition, H&C Clarishield Solvent-Based Gloss was used on the sidewalks to provide a durable, glossy finish that resists water, chemicals and UV rays. The painters also relied on Sherwin-Williams for all their application tools, everything from rollers to liners to grids to plastic to tape to rags to brushes. They even made use of Trimaco E-Z Floor Guards for guests to wear at the open house. As president of the Franklin Grove Area Historical Society, Brumbly has a special connection to this job. Still, he’s been amazed by the response it has generated in the community. ABOUT THE AUTHOR & PHOTOGRAPHER | Mike Starling earned his journalism stripes over a 20+year career working for newspapers, magazines, radio and TV. He has been a senior editor at Northbrook Publishing, a division of Randall-Reilly, since May 2000. As the editor of Professional Painting Contractor (PPC) magazine, he has traveled throughout North and Central America interviewing paint company owners and photographing their projects. He also edits the Sherwin-Williams CommercialPro newsletter and is the writer and director of their Pro On the Go video series. Photo of Starling on assignment in Ireland by Jeff Winke. Magazine article photography by Mike Starling: Dalton Harding (left) and his management team with the Calgary skyline; Michael Serafini and crew painter on location at the Boca Chica power plant in the Dominican Republic; Dave Barry on a job site in Boulder, Colorado; Lincoln Way Inn, Franklin Grove, Illinois; and St. Louis library color images. Black-and-white historic image courtesy St. Louis Central Library.